Stocks design: can arrange out within 3 days after get full payment B. Can Print logo on paper hang tags, finish within 7 days. B. After product arrived, we don&rsquo;t accept any complaint regarding size. Product name: Zakiyyah MD823 2016 factory wholesale new design Islamic women clothing hot seling muslim dress and dubai abaya in jordan Product number: MD823 Color:Picture shown Size:M/L/XL Material: HEMP MOQ:10 pcs MIX COLOR/MIX SIZE Packing way:one pcs in one plastic bag 10-50 pieces: 1-2 Work days 50-100 pieces:10-15 Works days 100-500piceces:15-25 Work days &gt;500 pieces:when you order,please contact our service . PRODUCT NAME Zakiyyah MD823 2016 factory wholesale new design Islamic women clothing hot seling muslim dress and dubai abaya in jordan COLOR Picture shown Size M/L/XL MATERIAL Hemp MOQ 10 pcs mix color/mix size PACKING one pcs/one bag or customer req u iremnent LEAD TIME Pls reference the send out time as above PAY MENT Paypal,Western union,T/T,MoneyGram M,L,XL we can supply from stock If you chose XL ,XXL ,you need to contact the sales manager Dimensions are for reference only SIZE in stock contact us S M L XL XXL bust 93.98 101.6 109.22 116.84 124.46 waist 81.28 88.9 96.52 104.14 111.76 Hip 99.06 106.68 114.3 121.92 129.54 Sleeve length 58.42 58.42 56.69 59.69 60.96 dress long 135 135 145 145 148 Product name: Zakiyyah 026 New Flower Design Abaya Fashion Long Sleeve Arab Abaya for Women Product number: 026 Color: Red,Grey,Black,Blue Size: M,L,XL Material: Korea hemp MOQ: 10 Pcs/ Color, Mix Size Packing way: 1pcs in 1 opp bag, or customer requirement MOQ: 10 Pcs/ Color, Mix Size Price: $10.44~14.24 For reference only,when you order please contact our manager! 50-100 pieces:15~20 days 100-500piceces:20~30 days &gt;500 pieces:when you order,please contact our service DIMENSIONS ARE FOR YOUR REFERENCE ONLY Size burst shoulder cuff waist sleeves length dress length M 94 36 59 140 L 98 37 60 142 XL 102 38 61 144 PRODUCT NAME Zakiyyah 026 New Flower Design Abaya Fashion Long Sleeve Arab Abaya for Women COLOR Red,Grey,Black,Blue Size M,L,XL MATERIAL Korea hemp MOQ 10 Pcs/ Color, Mix Size PACKING 1pcs in 1 opp bag, or customer requirement LEAD TIME After receipt of payment,20-25 work days (FOR REFERENCE ONLY) PAYMENT Paypal,Western union,T/T,MoneyGram Packaging & Shipping Contact us Shantou HotSunZune Garment Co. Product Name: Flower Print Abaya Designs African Straight Dress Islamic Clothes Product Type: African straight dress Model No. Ay Fashion, devoted to skirt designing, developing, producing and selling, has become one of the largest Africa skirt manufacturers in China. With an eye on the future, we will continue to be committed to guideline of quantity First, Service First. , for muslim ladies from any kind of fabric, including chiffon, cotton, sateen, satin, linen, silk, etc. 2015 new floral red brocaded pattern design flower abaya 15 years for China domestic market, all types of garment. Friendship as business relationship, your concern is our concern, at your service at any time. keyword yeola paithani sarees dongguan king malt fashion co.,ltd we have many self-developed designs and samples for you to choose. new fashion design abaya printed beautiful flower yeola paithani sarees product name abaya printed beautiful flower yeola paithani sarees style no. 2. We can change the measurements according to your requirements,meanwhile,we can provide you color card along with your sample. 3.Offering brand labels production service, you just need to tell us the specification requirements. 5.Regular notification of new styles & hot selling styles. latest design embroidered black muslim long dress dubai abaya ---Material: Polyblend ---Our MOQ: Low moq for the initial order,accept small quantity, we have our designers team, so your sample/ sketch can be manufactured; ---Samples: lead time 5-10 working days; ---Mass productions delivery time: 20-30 days ; ---Payment term: 1) We accept T/T, western Union, Paypal. 2) 30% for deposit with the order play, and 70% balance should be paid before shipping. ---About the label : We can put your neck lable,hand tag,care lable in your orders ---For the size : we can do as your size secification --- Quality control : we have two QC department, for the first time inspect the products including cutting the thread ends, ironing the order , clearing the stains , After, we need to check the size fit whether that is meet customers' size specification Packaging & Shipping Products procedures Offer fast service:sometime maybe I am not on computer so please check the below image to find somemore contact ways about us Thanks for your browsing and have a nice day!!! 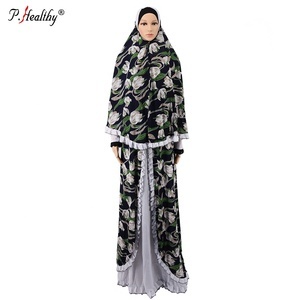 Abaya Front Open Embroidered Jilbab, Dubai Fancy Burqa/Best Flower Printed Decorative Black colour Abaya For sale. Our agent service is 24 hours and we will give you a nice serivice. Whatever you require, we will try our best to make it. If the goods is customized, the delivery is from 30 days to 60days. Alibaba.com offers 867 flower design abaya products. About 83% of these are islamic clothing, 1% are 100% polyester fabric, and 1% are plus size shirts & blouses. A wide variety of flower design abaya options are available to you, such as oem service, in-stock items. You can also choose from free samples. There are 870 flower design abaya suppliers, mainly located in Asia. The top supplying countries are China (Mainland), India, and Indonesia, which supply 94%, 3%, and 1% of flower design abaya respectively. Flower design abaya products are most popular in North America, Southeast Asia, and Western Europe. You can ensure product safety by selecting from certified suppliers, including 36 with Other, 27 with ISO9001, and 25 with BRC certification.